“In my opinion, this was the best possible way for me to launch my marketing activities”, says Konrad Antoniuk, MorphWear. “Presenting at CES was a big milestone in our project, so we also expect to be considered as serious candidates in future business decisions with potential partners”, Antoniuk continues. Jarle Holt, Overskudd, lists his three best topics from the CES project: strengthened confidence in the Overskudd solution being unique in a very big market, improved customer communication by being forced to quickly formulate the value proposition, again and again, and building relationships with the Suunto team through a lot of good discussions. 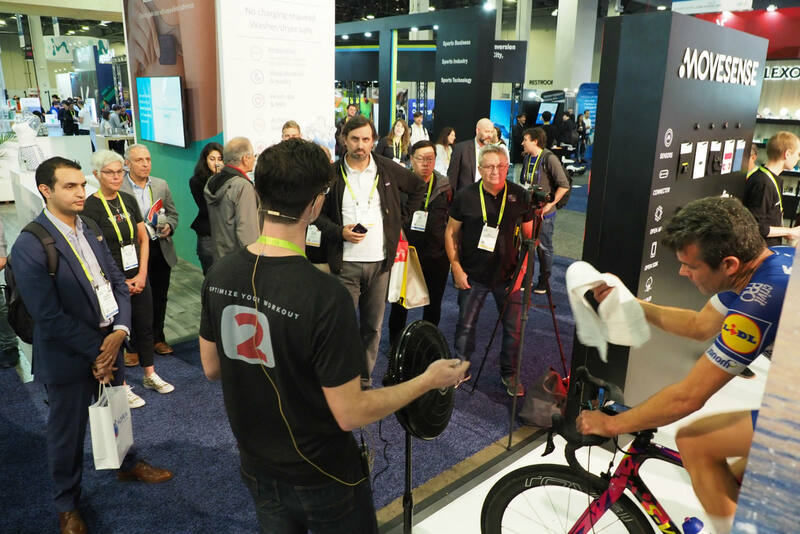 “Exhibiting at CES with Movesense/Suunto has allowed W2ND to network with other valuable companies and individuals in the industry”, says John Steel, W2ND. He also appreciated further establishing the professional connection with Suunto and enjoyed especially doing the demos (featured image). “There were much more people asking about W2ND when we had the bike spinning up than when we were just standing there”, Steel says and confirms the value of visual, attractive demos in a trade show environment. After highly positive and productive CES experience Movesense team will start working on the next opportunities for joint marketing activities. Stay tuned to learn more in the future and join the action when your product is ready enough to be unveiled to the world! Read our general conclusions from CES of the state of the wearables market here.